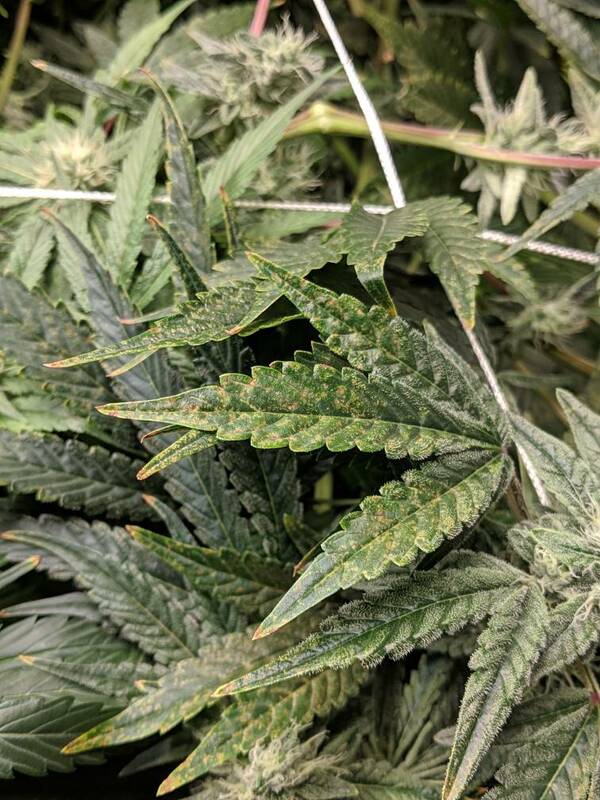 Thread: Is this light burn or nute burn? Could it be the lights or the nutrients? Looks more like nute burn but not seen it speckled like that. Defo got tip burn. If its light burn the leaves would be jagged and taco'd more. Looks like a late stage calcium deficiency with all those speckles with a touch of nute burn as Gardro quite rightly pointed out. You can try some specialized cal feed if you have or try some dolomite lime or garden lime, start out with half a teaspoon per litre (half the reccomended amount) and see how she responds. What I always like to do is treat with half the dosage that is recommended even with seemingly heavy deficiencies, as you can do more damage overdosing than not offering enough. Its an aeroponic grow with a hlg 550 in a 4*4 area, only some strains (gg4 in particular) are showing this symptom, im feeding half strength calmag during bloom, maybe up it to full strength? looks like salt build up, Tell us you EC and PH of your Res mate, and also whats falling and rising. Id say your EC was too high, and you need to reduce it.